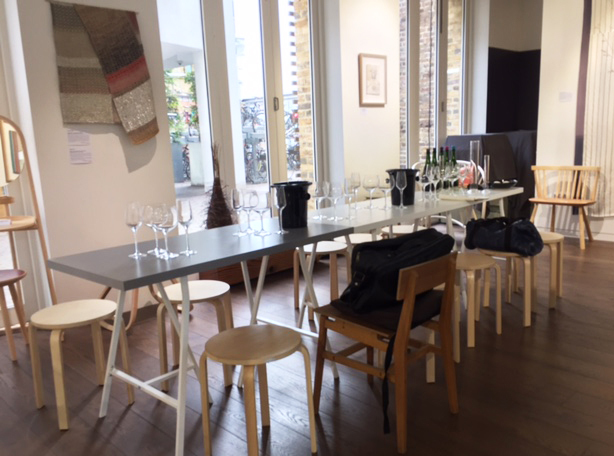 Last week, we at Sated had the pleasure of attending the birthday party of a “rather precocious, slightly tipsy 4-year-old”* – the multi-award-winning Digby Fine English Sparkling Wine company, at Contemporary Applied Arts Gallery in Southwark. 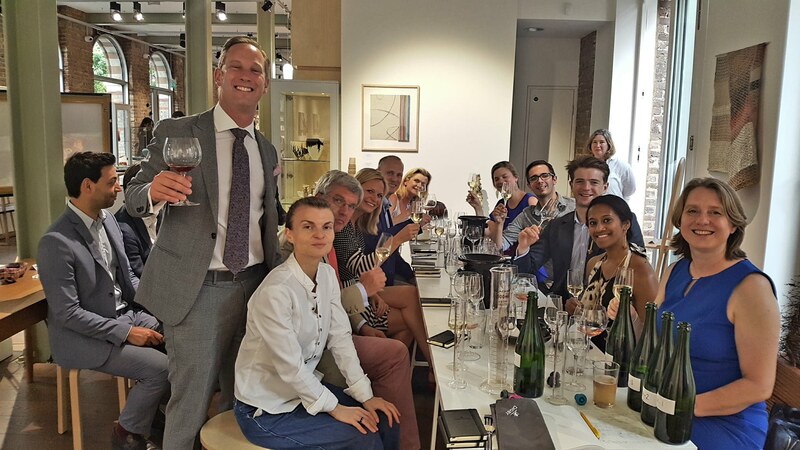 The evening comprised a Blending Salon hosted by Digby co-founder, the gregarious Trevor Clough, followed by a romp through their remarkable range of fizz and culminating in popping the cork of bottle number one of 500 of their 2009 Vintage Rosé Brut Magnum. If you’ve never heard of this delightful company before or if English sparkling wine has barely blipped on your radar, read on and prepare to become enamoured. 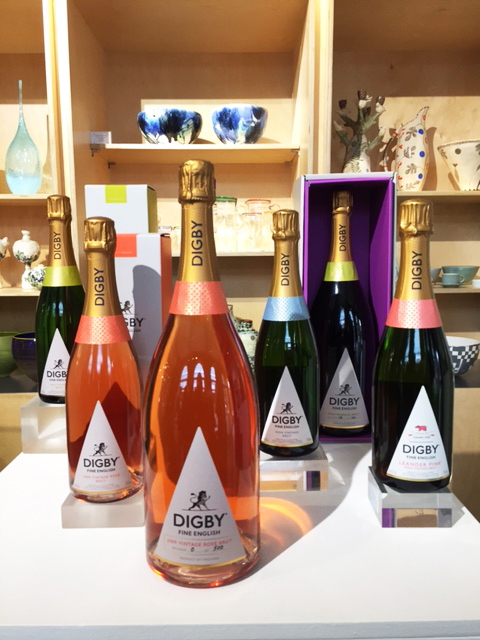 Trevor Clough and Jason Humphries launched Digby on 30th July 2013 with the seemingly lofty ambition to create world-class English fizz that would rival its Gallic, Italian and Spanish cousins. Distant as this dream may have appeared to the amateur imbiber, the pair were steadfast in their belief that the terroir and weather of England’s South East coast had all the ingredients to make it come true, and the past four years have proven them to be entirely right. Made from a blend of Pinot Noir, Pinot Meunier and Chardonnay grapes grown across Kent, Sussex, Hampshire and Dorset on greensand and sandstone, it is this diversity that gives Digby its hallmark richness of flavour and texture. When questioned on the mix, Trevor explains that while they are blending across sites, Digby is ironically obsessed with place. He expounds by happily stating, “We are not trying to make a wine of one place in England, we are trying to produce the best wine in England and this comes from bringing different parcels together”. 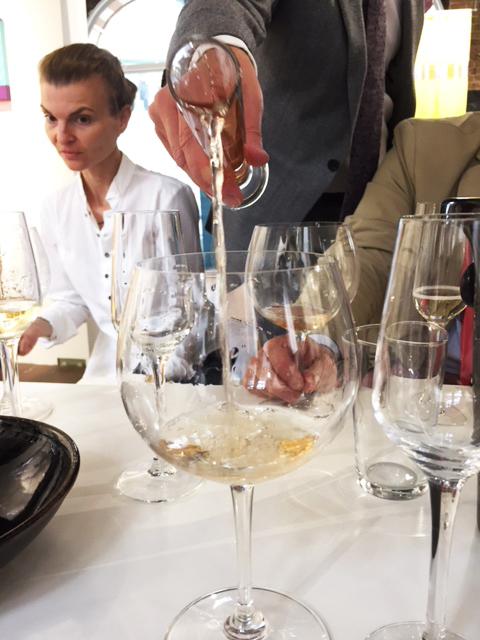 After this titillating introduction, the Blending Salon commences, where we are treated to tasters of the individual wines employed in the creation of their flagship 2015 Vintage Reserve Brut. The first is a greensand-grown resident of Hampshire that certainly packs a punch. Baked apples and creaminess on the nose are followed by a puckering of citrus. Crisp green apples smack down on the palate and are underpinned by a wet stone, chalky minerality. Embedded in the sandstone of the Dorset/Hampshire border, the next is quite a different character: floral and peppery on the nose, it is fantastically textured, complex and structured for a component of a blend. Although neighbouring Chardonnays, they could not be more different in personality. The third Chardonnay – this one grown on sandstone in the warmer climate of West Sussex – is similarly individual with a riper, rounded profile evoking bruised apples, stone fruit and a surprising sweet spice. This enigmatic fellow has us all a bit baffled until Trevor informs us that the scale and body of this wine come from the fact that their “mad genius, over the top, hand-flapping, swearing Irish artist” winemaker, Dermot Sugrue, has chosen to vinify it in oak Burgundy barrels. Once we have tasted the three Chardonnays, Trevor creates a pre-blend composed of 60% of the brash Hampshire, 30% of its more refined neighbour and 10% of the oaky oddball. The result is a structured and developed young wine that has the energy from the first but the nuance and creativity of the latter two. Now that we have our Chardonnay concoction, we are introduced to the last component of the mix – a bronze-y 60% Pinot Noir, 40% Pinot Meunier blend from the same sandstone vineyard as the second wine. Seriously expressive and dynamic, we pinpoint fragrant rose petals, fresh peach and summer berries with a subtle waft of smoky minerality. This combines with the Chardonnay pre-blend in a 2/3 Chardonnay to 1/3 Pinot ratio to create the basis for the 2015 Vintage Reserve Brut. We take a sip and are astounded by the abundance of identifiable fruit characters that swarm our palates whilst the young wine remains fresh and vibrant. This is a truly developed and rounded blend that is immensely quaffable. Pretty pleased with our instruction in the ways of Digby, we get ready to move on to the tasting part of the evening. 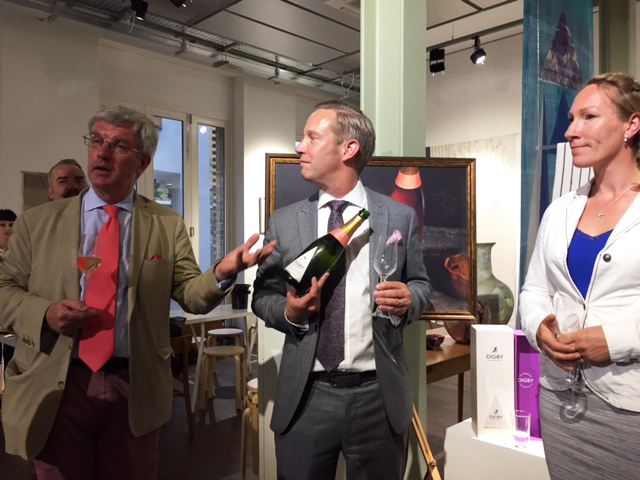 However, before we do so, Trevor surprises us with a cheeky preview of Leander Pink, a sparkling rosé created in partnership with Leander Club – the famous Henley-based Rowing & Private Members’ Club, known for being the most successful single sport club in the world. Whilst this coupling may seem a tad peculiar at first, the reality is that what you have here is a world-class club coming together with a world-class wine company to produce a pedigree lovechild destined for greatness. Trevor masterfully blends a controversially savoury, earthy Pinot Noir with the previous Chardonnay & Pinot Noir blend to form a fruity delight bursting with sour cherry, rhubarb and floral notes. With the wonderfully eye-opening demonstration completed, we pick ourselves up and get ready for the party to begin! 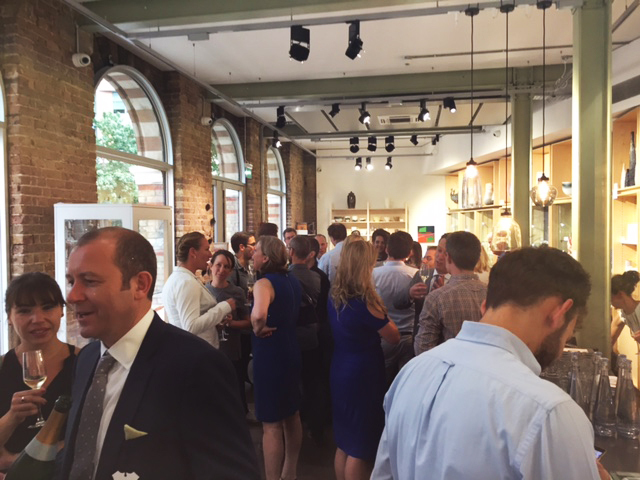 Mingling ensues assisted by a seemingly endless supply of Digby’s finest. 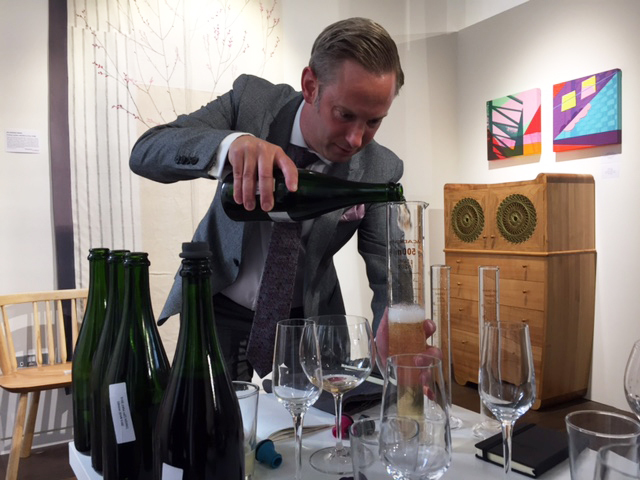 Starting with the stunning 2010 Vintage Reserve Brut – the flagship that Trevor and Jason are travelling the globe promoting and which has just won a trophy at the UK Wine Awards – we proceed through their cellar. The Vintage Brut is refined and characterful. A semblance of baked apple and a memory of creaminess waft about the glass whilst the palate is lightly citric and upfront. Complex yet easy-drinking, this is a stunning specimen that can be admired on its own or accompany a variety of party canapés. Next up is its non-vintage brother, a laidback fella who “doesn’t wear a tie, has some buttons undone and if he’s made it through to Tuesday without having a glass, he’s pretty disappointed.” This rogue is fruiter, more relaxed and unsurprisingly Digby’s number one seller in America. The 2009 Vintage Rosé Brut is the hardest to get hold of. You might be able to find a bottle knocking around Hedonism Wines, Harvey Nichols, Selfridges and Fortnum & Mason, but if you want to enjoy a glass, you’ll need to head to Hakkasan who have purchased almost every remaining bottle in their determination to provide it all year round, pairing it with their three Cantonese flavour zones of salty, umami and sweet. The earthy grip of the Pinots and the structure of the Chardonnays make this a phenomenally gastronomic wine, often paired with steak, pork or veal. 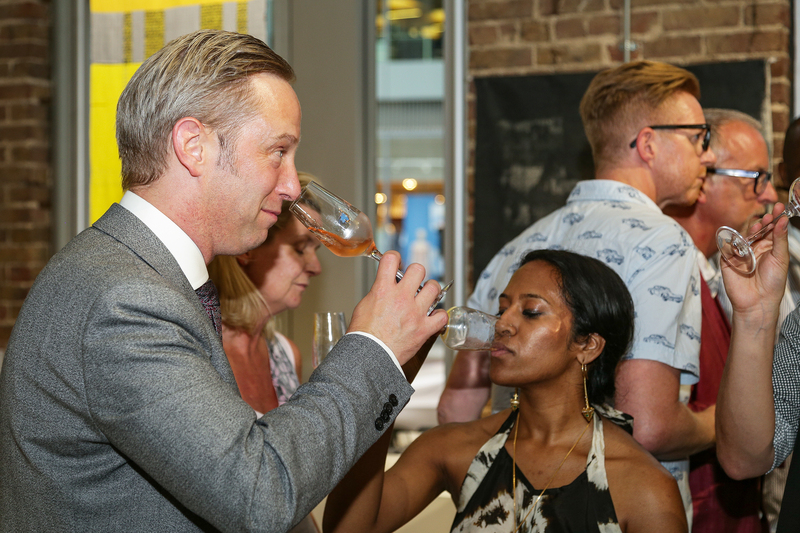 Once we’ve had a couple of sips of the beauty, Trevor and Jason take the stage with the evening’s biggest treat – bottle number one of their 2010 Vintage Rosé Magnum. Admitting that they have never tasted this vintage in magnum before – apparently this bottling changes the taste of the wine – the cork is popped with due ceremony and we are each granted a taste of the luscious liquid. 80% Pinot Noir, 20% Chardonnay, the greensand-grown grapes aged over seven years come together to create a fine wine with strawberry notes and n underlying smokiness that matures beautifully and tickles the palate with its giggling fizz. The main spectacle complete, we are treated to a moreish dessert as the Leander Pink is poured and Paul Budd and Olympic medallist Debbie Flood round off our evening by inspiring us with tales of athletic prowess and anecdotes of how 1,022 bottles of the Digby-Leander creation found their homes in the bellies of Henley Royal Regatta attendees earlier this year. Whilst spectacular in itself, what is most admirable about Leander Pink is that a proportion of all profits made go towards helping young athletes achieve their dreams at the club, meaning that all imbibers are a part of getting British rowers to the Olympics! Not a bad thought when you’re lounging about, quaffing a glass or four by the Thames or in the comfort of your own home. The night ended with much merriment and we come away with a fantastic sense of having truly discovered something new, unique and gastronomically rewarding. 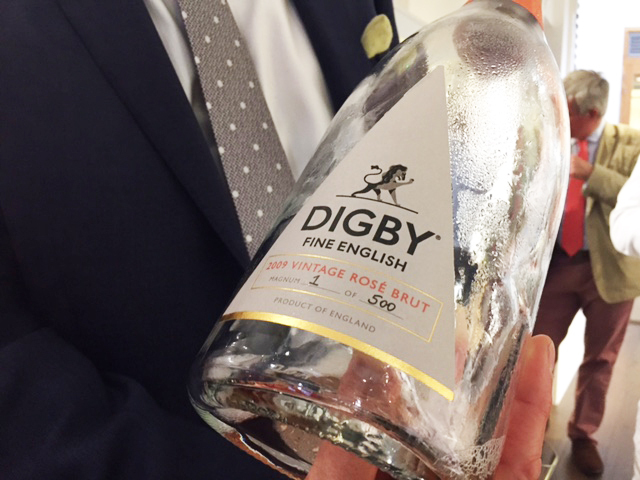 Digby Fine English Sparkling Wine has certainly set a precedence for British fizz in our minds, the UK and globally, and we cannot wait to watch them skyrocket as a company. For more information about Digby Fine English, visit their website here.